John Ronald Reuel Tolkien CBE ( 3 January 1892 – 2 September 1973) was an English writer and university professor who is best known as the author of The Hobbit and The Lord of the Rings. He was an Oxford professor of Anglo-Saxon language ( 1925 to 1945) and English language and literature ( 1945 to 1959). He was a strongly committed Roman Catholic. Tolkien was a close friend of C. S. Lewis; they were both members of the informal literary discussion group known as the Inklings. In addition to The Hobbit and The Lord of the Rings, Tolkien's published fiction includes The Silmarillion and other posthumously published books, which taken together is a connected body of tales, fictional histories, invented languages, and literary essays about an imagined world called Arda, and Middle-earth (derived from the Old English word middangeard, the lands inhabitable by humans) in particular, loosely identified as an "alternative" remote past of our own world. Tolkien applied the word legendarium to the totality of these writings. Most of the posthumously published books were compiled from Tolkien's notes by his son Christopher Tolkien. While fantasy authors such as William Morris, Robert E. Howard and E. R. Eddison preceded Tolkien, the great success and enduring influence of his works have led to him being popularly, if perhaps inaccurately, identified as the " father of modern fantasy literature". In any case, Tolkien's work has had an indisputable and lasting effect on the field and related media; many fantasy settings like Dungeons & Dragons and Warhammer Fantasy owe much of their mythology, directly or indirectly, to him. As far as is known, most of Tolkien's paternal ancestors were craftsmen. The Tolkien family had its roots in Saxony (Germany), but had been living in England since the 18th century, becoming "quickly and intensely English". The surname Tolkien is Anglicized from Tollkiehn (i.e. German tollkühn, "foolhardy"; the etymological English translation would be dull-keen, a literal translation of oxymoron). The surname Rashbold given to two characters in Tolkien's The Notion Club Papers is a pun on this. Tolkien's maternal grandparents, John and Edith Jane Suffield, lived in Birmingham and owned a shop in the city centre. The Suffield family had had a business in a building called Lamb House since 1812. From 1812 William Suffield ran a book and stationery shop there; Tolkien's great-grandfather, also John Suffield, was there from 1826 with a drapery and hosiery business. Tolkien was born on 3 January 1892, in Bloemfontein in the Orange Free State (now Free State Province, South Africa), to Arthur Reuel Tolkien (1857–1896), an English bank manager, and his wife Mabel, née Suffield ( 1870– 1904). 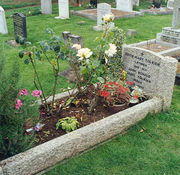 Tolkien had one sibling, his younger brother, Hilary Arthur Reuel, who was born on 17 February 1894. Mabel tutored her two sons, and Ronald, as he was known in the family, was a keen pupil. She taught him a great deal of botany, and she awakened in her son the enjoyment of the look and feel of plants. Young Tolkien liked to draw landscapes and trees. But his favourite lessons were those concerning languages, and his mother taught him the rudiments of Latin very early. He could read by the age of four, and could write fluently soon afterwards. His mother got him lots of books to read. He disliked Treasure Island and The Pied Piper. He thought Alice's Adventures in Wonderland by Lewis Carroll was amusing, but also thought that Alice's adventures in it were disturbing. But he liked stories about Native Americans, and also the fantasy works by George MacDonald. He attended King Edward's School, Birmingham and, while a student there, helped "line the route" for the coronation parade of King George V, being posted just outside the gates of Buckingham Palace. He later attended St. Philip's School and Exeter College, Oxford. His mother converted to Roman Catholicism in 1900 despite vehement protests by her Baptist family who then suspended all financial assistance to her. She died of complications due to diabetes in 1904, when Tolkien was twelve, at Fern Cottage in Rednal, which they were then renting. For the rest of his life Tolkien felt that she had become a martyr for her faith, which had a profound effect on his own Catholic beliefs. Tolkien's devout faith was significant in the conversion of C. S. Lewis to Christianity, though Tolkien was greatly disappointed that Lewis chose to return to the Anglicanism of his upbringing. Tolkien met and fell in love with Edith Mary Bratt at the age of sixteen, though she was three years his senior. Father Francis forbade him from meeting, talking, or even corresponding with her until he was twenty-one. He obeyed this prohibition to the letter. In 1911, while they were at King Edward's School, Birmingham, Tolkien and three friends, Rob Gilson, Geoffrey Smith and Christopher Wiseman, formed a semi-secret society which they called "the T.C.B.S. ", the initials standing for "Tea Club and Barrovian Society", alluding to their fondness of drinking tea in Barrow's Stores near the school and, illicitly, in the school library. After leaving school, the members stayed in touch, and in December 1914, they held a "Council" in London, at Wiseman's home. For Tolkien, the result of this meeting was a strong dedication to writing poetry. In the summer of 1911, Tolkien went on holiday in Switzerland, a trip that he recollects vividly in a 1968 letter, noting that Bilbo's journey across the Misty Mountains ("including the glissade down the slithering stones into the pine woods") is directly based on his adventures as their party of twelve hiked from Interlaken to Lauterbrunnen, and on to camp in the moraines beyond Mürren. Fifty-seven years later, Tolkien remembers his regret at leaving the view of the eternal snows of Jungfrau and Silberhorn ("the Silvertine ( Celebdil) of my dreams"). They went across the Kleine Scheidegg on to Grindelwald and across the Grosse Scheidegg to Meiringen. They continued across the Grimsel Pass and through the upper Valais to Brig, and on to the Aletsch glacier and Zermatt. On the evening of his twenty-first birthday, Tolkien wrote to Edith a declaration of his love and asked her to marry him. She replied saying that she was already engaged but had done so because she had believed Tolkien had forgotten her. The two met up and beneath a railway viaduct renewed their love; Edith returned her ring and chose to marry Tolkien instead. Following their engagement Edith converted to Catholicism at Tolkien's insistence. They were engaged in Birmingham, in January 1913, and married in Warwick, England, on 22 March 1916. 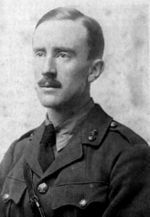 After graduating from the University of Oxford (where he was a member of Exeter College) with a first-class degree in English language in 1915, Tolkien joined the British Army effort in World War I and served as a second lieutenant in the eleventh battalion of the Lancashire Fusiliers. His battalion was moved to France in 1916, where Tolkien served as a communications officer during the Battle of the Somme until he came down with trench fever on 27 October 1916 and was moved back to England on 8 November 1916. Many of his close friends, including Gilson and Smith of the T.C.B.S., were killed in the war. Tolkien's Webley .455 Service Revolver is currently on display in the Imperial War Museum, London in a World War I exhibition. During his recovery in a cottage in Great Haywood, Staffordshire, England, he began to work on what he called The Book of Lost Tales, beginning with The Fall of Gondolin. Throughout 1917 and 1918 his illness kept recurring, but he had recovered enough to do home service at various camps, and was promoted to lieutenant. When he was stationed at Kingston upon Hull, one day he and Edith went walking in the woods at nearby Roos, and Edith began to dance for him in a clearing among the flowering hemlock: "We walked in a wood where hemlock was growing, a sea of white flowers". This incident inspired the account of the meeting of Beren and Lúthien, and Tolkien often referred to Edith as his Lúthien. Tolkien's first civilian job after World War I was at the Oxford English Dictionary, where he worked mainly on the history and etymology of words of Germanic origin beginning with the letter W. In 1920 he took up a post as Reader in English language at the University of Leeds, and in 1924 was made a professor there, but in 1925 he returned to Oxford as Rawlinson and Bosworth Professor of Anglo-Saxon, with a courtesy fellowship at Pembroke College. 20 Northmoor Road, the former home of J.R.R. Tolkien in North Oxford. In 1945, he moved to Merton College, Oxford, becoming the Merton Professor of English Language and Literature, in which post he remained until his retirement in 1959. Tolkien completed The Lord of the Rings in 1948, close to a decade after the first sketches. During the 1950s, Tolkien spent many of his long academic holidays at the home of his son John Francis in Stoke-on-Trent. Tolkien had an intense dislike for the side effects of industrialization which he considered a devouring of the English countryside. For most of his adult life, he eschewed automobiles, preferring to ride a bicycle. This attitude is perceptible from some parts of his work such as the forced industrialization of The Shire in The Lord of the Rings. W. H. Auden was a frequent correspondent and long-time friend of Tolkien's, initiated by Auden's fascination with The Lord of the Rings: Auden was among the most prominent early critics to praise the work. Tolkien wrote in a 1971 letter, "I am […] very deeply in Auden's debt in recent years. His support of me and interest in my work has been one of my chief encouragements. He gave me very good reviews, notices and letters from the beginning when it was by no means a popular thing to do. He was, in fact, sneered at for it." Tolkien and Edith had four children: Rev. John Francis Reuel ( 17 November 1917 – 22 January 2003), Michael Hilary Reuel (October 1920–1984), Christopher John Reuel (born 21 November 1924) and Priscilla Anne Reuel (born 1929). Fan attention became so intense that Tolkien had to take his phone number out of the public directory, and eventually he and Edith moved to Bournemouth on the south coast. Tolkien was awarded the CBE by Queen Elizabeth II at Buckingham Palace on 28 March 1972. His medal was stolen from his room later that night. The medal was returned much later[ citation needed], but the thief was never identified. Posthumously named after Tolkien are the Tolkien Road in Eastbourne, East Sussex, and the asteroid 2675 Tolkien. Tolkien Way in Stoke-on-Trent is named after Tolkien's son, Fr. John Francis Tolkien, who was the priest in charge at the nearby Roman Catholic Church of Our Lady of the Angels and St. Peter in Chains. There is also a professorship in his name at Oxford. Tolkien was a devout Roman Catholic, and in his religious and political views he was mostly conservative, in the sense of favouring established conventions and orthodoxies over innovation and modernization. Tolkien's devout faith was significant in the conversion of C. S. Lewis from atheism to Christianity, though Tolkien was greatly disappointed that Lewis chose to return to Anglicanism, rather than becoming a Roman Catholic like himself. Tolkien became supportive of Francisco Franco during the Spanish Civil War when he learned the Republicans were destroying churches and killing priests and nuns. He believed that Hitler was less dangerous than the Soviets: he wrote in a letter during the Munich Crisis that he believed that the Soviets were ultimately responsible for the problems and that they were trying to play the British and the French against Hitler. Though some people's perceptions of Tolkien as a racist or racialist have been a matter of scholarly discussion, statements made by Tolkien during his lifetime would seem to disprove such accusations. He regarded Nazi anti-Semitism as "pernicious and unscientific". He also called the "treatment of colour" (i.e. apartheid) in his birthplace South Africa horrifying, and spoke out against it in a valedictory address to the University of Oxford in 1959. Tolkien, having lost most of his friends in the trenches of World War I, was opposed to war in general,[ citation needed] stating near the end of the war that the Allies were no better than their opponents, behaving like Orcs in their calls for a complete destruction of Germany. He was horrified by the atomic bombings of Hiroshima and Nagasaki, referring to its creators as "lunatics" and "babel builders". He also was known to be forever embittered towards Nazism for appropriating the Germanic heritage which he had dedicated his life to studying and preserving, and perverting it to fit their own bigoted model of Aryan racial supremacy, a school of thought to which he had never subscribed, and which he surmised would forever taint Germanic culture by association. His writings also evidence a strong respect for nature, and he wrote disparagingly of the wanton destruction of forests and wildlife. Tolkien also once described himself as an anarchist, or rather anarcho-monarchist. Beginning with The Book of Lost Tales, written while recuperating from illness during World War I, Tolkien devised several themes that were reused in successive drafts of his legendarium. The two most prominent stories, the tales of Beren and Lúthien and that of Túrin, were carried forward into long narrative poems (published in The Lays of Beleriand). Tolkien wrote a brief summary of the legendarium these poems were intended to represent, and that summary eventually evolved into The Silmarillion, an epic history that Tolkien started three times but never published. Tolkien hoped to publish it along with the Lord of the Rings, but publishers (both Allen & Unwin and Collins) got cold feet; moreover printing costs were very high in the post-war years, leading to the Lord of the Rings being published in three books. The story of this continuous redrafting is told in the posthumous series The History of Middle-earth. From around 1936, he began to extend this framework to include the tale of The Fall of Númenor, which was inspired by the legend of Atlantis. Tolkien was strongly influenced by English history and legends which he often confessed his love for, but he also drew influence from Scottish and Welsh history and legends as well from many other European countries, namely Scandinavia and Germany. He was also influenced by Anglo-Saxon literature, Germanic and Norse mythologies, Finnish mythology and the Bible. The works most often cited as sources for Tolkien's stories include Beowulf, the Kalevala, the Poetic Edda, the Volsunga saga and the Hervarar saga. Tolkien himself acknowledged Homer, Sophocles, and the Kalevala as influences or sources for some of his stories and ideas. His borrowings also came from numerous Middle English works and poems. A major philosophical influence on his writing is King Alfred's Anglo-Saxon version of Boethius' Consolation of Philosophy known as the Lays of Boethius. Characters in The Lord of the Rings such as Frodo, Treebeard, and Elrond make noticeably Boethian remarks. Also, Catholic theology and imagery played a part in fashioning his creative imagination, suffused as it was by his deeply religious spirit. In addition to his mythopoetic compositions, Tolkien enjoyed inventing fantasy stories to entertain his children. He wrote annual Christmas letters from Father Christmas for them, building up a series of short stories (later compiled and published as The Father Christmas Letters). Other stories included Mr. Bliss, Roverandom, Smith of Wootton Major, Farmer Giles of Ham and Leaf by Niggle. Roverandom and Smith of Wootton Major, like The Hobbit, borrowed ideas from his legendarium. Leaf by Niggle appears to be an autobiographical allegory, in which a "very small man", Niggle, works on a painting of a tree, but is so caught up with painstakingly painting individual leaves or elaborating the background, or so distracted by the demands of his neighbour, that he never manages to complete it. Tolkien continued to work on the history of Middle-earth until his death. His son Christopher (with some assistance from Guy Gavriel Kay, later a well-known fantasy author in his own right) organized some of this material into one volume, published as The Silmarillion in 1977. In 1980 Christopher Tolkien followed this with a collection of more fragmentary material under the title Unfinished Tales, and in subsequent years he published a massive amount of background material on the creation of Middle-earth in the twelve volumes of The History of Middle-earth. All these posthumous works contain unfinished, abandoned, alternative and outright contradictory accounts, since they were always a work in progress, and Tolkien only rarely settled on a definitive version for any of the stories. There is not even complete consistency to be found between The Lord of the Rings and The Hobbit, the two most closely related works, because Tolkien was never able to fully integrate all their traditions into each other. He commented in 1965, while editing The Hobbit for a third edition, that he would have preferred to completely rewrite the entire book. The Lord of the Rings became immensely popular in the 1960s and has remained so ever since, ranking as one of the most popular works of fiction of the twentieth century, judged by both sales and reader surveys. In the 2003 " Big Read" survey conducted by the BBC, The Lord of the Rings was found to be the "Nation's Best-loved Book". Australians voted The Lord of the Rings " My Favourite Book" in a 2004 survey conducted by the Australian ABC. In a 1999 poll of Amazon.com customers, The Lord of the Rings was judged to be their favourite "book of the millennium". In 2002 Tolkien was voted the ninety-second " greatest Briton" in a poll conducted by the BBC, and in 2004 he was voted thirty-fifth in the SABC3's Great South Africans, the only person to appear in both lists. His popularity is not limited just to the English-speaking world: in a 2004 poll inspired by the UK’s "Big Read" survey, about 250,000 Germans found The Lord of the Rings ( Der Herr der Ringe) to be their favourite work of literature. In September 2006, Christopher Tolkien, who had spent 30 years working on his father's unpublished manuscripts, announced that The Children of Húrin has been edited into a completed work for publication in 2007. J. R. R. Tolkien had first written what he called the Húrin's saga (and later the Narn) in 1918, and rewritten it several times, including as an epic poem, but never completed his mature, novelistic version. Extracts from the latter had been published before by Christopher Tolkien in "Unfinished Tales", with other texts appearing in The Silmarillion and his later literary investigations of The History of Middle-earth. Both Tolkien's academic career and his literary production are inseparable from his love of language and philology. He specialized in Ancient Greek philology in college, and in 1915 graduated with Old Icelandic as special subject. He worked for the Oxford English Dictionary from 1918, and is credited with having worked on a number of W words, including walrus, over which he struggled mightily. In 1920, he went to Leeds as Reader in English Language, where he claimed credit for raising the number of students of linguistics from five to twenty. He gave courses in Old English heroic verse, history of English, various Old English and Middle English texts, Old and Middle English philology, introductory Germanic philology, Gothic, Old Icelandic, and Medieval Welsh. When in 1925, aged thirty-three, Tolkien applied for the Rawlinson and Bosworth Professorship of Anglo-Saxon, he boasted that his students of Germanic philology in Leeds had even formed a " Viking Club". Privately, Tolkien was attracted to "things of racial and linguistic significance", and he entertained notions of an inherited taste of language, which he termed the "native tongue" as opposed to "cradle tongue" in his 1955 lecture English and Welsh, which is crucial to his understanding of race and language. He considered west-midland Middle English his own "native tongue", and, as he wrote to W. H. Auden in 1955, "I am a West-midlander by blood (and took to early west-midland Middle English as a known tongue as soon as I set eyes on it)"
Parallel to Tolkien's professional work as a philologist, and sometimes overshadowing this work, to the effect that his academic output remained rather thin, was his affection for the construction of artificial languages. The best developed of these are Quenya and Sindarin, the etymological connection between which formed the core of much of Tolkien's legendarium. Language and grammar for Tolkien was a matter of aesthetics and euphony, and Quenya in particular was designed from "phonaesthetic" considerations; it was intended as an "Elvenlatin", and was phonologically based on Latin, with ingredients from Finnish and Greek. A notable addition came in late 1945 with Adûnaic or Númenórean, a language of a "faintly Semitic flavour", connected with Tolkien's Atlantis legend, which by The Notion Club Papers ties directly into his ideas about inheritability of language, and via the " Second Age" and the story of Eärendil was grounded in the legendarium, thereby providing a link of Tolkien's twentieth-century "real primary world" with the legendary past of his Middle-earth. Tolkien considered languages inseparable from the mythology associated with them, and he consequently took a dim view of auxiliary languages: in 1930 a congress of Esperantists were told as much by him, in his lecture A Secret Vice, "Your language construction will breed a mythology", but by 1956 he concluded that " Volapük, Esperanto, Ido, Novial, &c, &c, are dead, far deader than ancient unused languages, because their authors never invented any Esperanto legends". The hands and minds of many artists have indeed been inspired by Tolkien's legends. Personally known to him were Pauline Baynes (Tolkien's favourite illustrator of The Adventures of Tom Bombadil and Farmer Giles of Ham) and Donald Swann (who set the music to The Road Goes Ever On). Queen Margrethe II of Denmark created illustrations to The Lord of the Rings in the early 1970s. She sent them to Tolkien, who was struck by the similarity they bore in style to his own drawings. It might be advisable […] to let the Americans do what seems good to them — as long as it was possible […] to veto anything from or influenced by the Disney studios (for all whose works I have a heartfelt loathing). United Artists never made a film, though at least John Boorman was planning a film in the early seventies. It would have been a live-action film which apparently would have been more to Tolkien's liking than an animated film. In 1976 the rights were sold to Tolkien Enterprises, a division of the Saul Zaentz Company, and the first movie adaptation (an animated rotoscoping film) of The Lord of the Rings appeared only after Tolkien's death (in 1978, directed by Ralph Bakshi). The screenplay was written by the fantasy writer Peter S. Beagle. This first adaptation, however, only contained the first half of the story that is The Lord of the Rings. In 1977 an animated TV production of The Hobbit was made by Rankin-Bass, and in 1980 they produced an animated film titled The Return of the King, which covered some of the portion of The Lord of the Rings that Bakshi was unable to complete. In 2001–3, New Line Cinema released The Lord of the Rings as a trilogy of live-action films, augmented by digital animation, directed by Peter Jackson. Several Led Zeppelin songs include references to Tolkien's work including Ramble On (for example one line refers to "...the darkest depths of Mordor"), and the "Battle of Evermore" (which features a reference to the Ringwraiths).